Kirsty Idema joined our administrative team in November 2014, with a background in Massage Therapy and Personal Training. 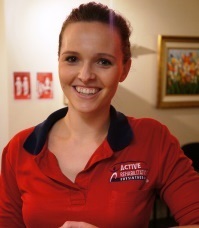 After completing her BA in Human Movement Sciences in Pretoria, South Africa in 2010, Kirsty moved to Brisbane. Kirsty came to us with several years of administration and customer service experience in physiotherapy and veterinary administration, as well as having worked in the hospitality industry. Through her travels and interaction with people all over the world, Kirsty has gained an understanding and respect for people from all walks of life, which she brings to her role as a senior administrator. She is fascinated by the human body and takes every opportunity to learn from others. In her spare time, Kirsty enjoys walking, swimming and keeping fit. She also loves baking and sourcing Brisbane’s best restaurants and cafes.